When I was first getting into the field of strength and conditioning, I remember feeling overwhelmed any time I was asked to write out a training program for someone. I’d often spend hours writing out a single program, only to decide it wasn’t good enough and start over. From the very beginning, I was fortunate enough to be working with some very high-level athletes — and that meant a lot of responsibility. The last thing I wanted to do was to give them a program that didn’t work or deliver the results they were expecting. I never wanted to be the reason they lost a fight, or the game, or didn’t make the team. What exercises should I use? How many sets should I have them do? How should I break up the training week? Should I use block training or conjugate periodization? Do I really understand what those terms even mean? For a long time, I thought the more reading and the more studying I did, the easier things would become. I tore through book after book – I even read Supertraining from cover to cover – and literally traveled around the world going to different workshops and learning from different experts. I was convinced that the key to being a great coach was just stuffing my head with as much information about programming as I could. If I just studied enough different periodization models and kept trying to make heads or tails out of soviet training manuals written 30 years ago, I figured that writing programs would eventually become easy. Like most coaches, I struggled to put all the pieces together. The more books on training and programming I read, the less confident I felt in my ability to program. Even worse, I wasn’t getting faster at writing programs, I was getting slower. The term “paralysis by analysis” described my programming efforts perfectly. If this story sounds familiar, it’s because it’s an extremely common problem in the training world. Everyone wants to be the best trainer or coach possible, everyone wants to write world-class programs that deliver results…but at one time or another, literally everyone struggles with how to put all the pieces together to actually do it. This is why I get far more questions about how to program than anything else. Programming can be challenging and there are so many different ways it can be done and different opinions on what’s right and what’s wrong, it’s easy to get lost in the details and miss the big picture. This is likely the way things would have continued for me if I hadn’t stumbled upon something that changed the way I approached writing programs altogether. Ironically, the solution to my problem didn’t come from reading more about training or programming at all. I created my own system to build world-class programs — and that’s when everything changed. You see, at the time, I had opened my own gym a few years ago. Like so many other small gym owners, I quickly discovered I knew a whole lot more about training than about running a business and I knew I had to do something about it. I had no problem staying busy training clients and athletes all day long, but when it came time to doing everything else that you have to do to run a business, I was mostly lost. In an effort to fix things and make sure I stayed in business, I did the same thing I had always done…I started reading everything I could find on the subject. Fortunately, this time my efforts paid off fairly quickly, but in a way I could never have anticipated. One of the first books I read was called The E Myth by Michael Gerber and it was a book about the single biggest reason why most small businesses fail : they lack systems. Systems are what make it possible to successfully scale a business from a small, single restaurant into a billion dollar franchise – think McDonalds, Subway, Chipotle, etc. When you go into any of those restaurants, literally anywhere in the country, it’s exactly the same. The layouts are the same, the lighting is the same, the food tastes the same, etc. The reason they are all the same is because they are all running the same systems. Not only did I lack systems to build my business properly, I lacked a system to build programs. I realized that creating a system was the only way I was going to ever really get good at writing programs. Writing a successful program and building a successful business have a lot in common. To do both well you have to know how to put together a lot of different pieces. If you don’t have the right process in place, the result is usually chaos and results will suffer. Building your own system will solve your problems and help you write more effective programs in half the time. Over the next few years, I spent a ton of time working on creating my own system to write programs. At first, I started out with big checklists and processes to build programs that helped organize everything. I started getting better and more confident in writing good programs, but it was still taking me far too long to get everything done. I knew I had the right idea, systemization was the answer I had been looking for, I just needed to figure out how to simplify writing programs into the fewest steps possible. Eventually, I was able to streamline the entire system into just five steps. After doing it over and over again, I realized that no matter who I was writing a program for, whether it was a combat athlete, a housewife, a Microsoft executive, or anyone in between, the same five steps were all that were needed. Today, I can create an entire program in 15 minutes or less using this simple 5-step system. I don’t waste time worrying about the details, I don’t feel like I’m starting from scratch each time I create a new program and I know my programs are going to deliver results because the system has been proven. If you’ve ever struggled to put all the pieces together, or felt like writing programs was a chore that you put off until the last minute because it takes too long, I guarantee building your own system will solve your problems and help you write more effective programs in half the time. 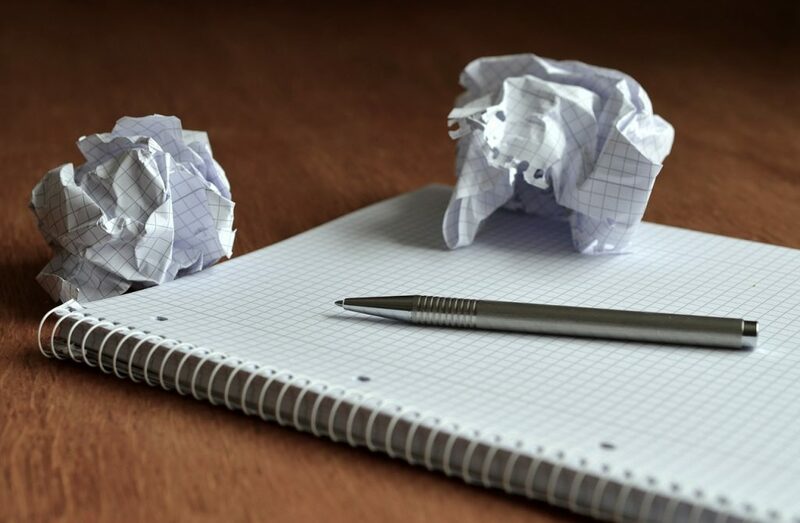 At this point, I’ve written more programs than I could ever count using this 5-step system. Put simply: It works. Whether you’re a strength and conditioning coach, a personal trainer, or an athlete that writes your own program, I guarantee following the five steps I’ve outlined below will make your life easier and your programs more effective. The first place to start when it comes time to put your putting your programming system to work is to start by setting the goals of the training block. Though the term “block training” has been thrown around and given different meanings in recent years, the simplest way to think about a training block is a period of time where you’re focusing on improving one particular area of fitness. If your testing and assessment showed there was a weakness in conditioning, for example, then you’d want to put together a conditioning block where the methods, exercises, etc. are put together and designed to improve it. For all intents and purposes, a training block is nothing more than a period of time where everything is designed to address a specific goal, so of course defining that goal is the place to start. Although it may be tempting to set goals that are very general, using overly broad terms like, “I want to improve conditioning” is a big mistake and one made far too often. To build an effective program, the goals have to be very specific and most importantly, they need to be measureable. If you don’t have a specific and measureable goal, after all, how can you have any idea if you’re actually working towards it? Overly vague goals make it impossible to measure progress and get the program off on the wrong foot. Your methods, exercises, etc., should all be focused around working to hit the program goals, so the more specific you can make them, the better. What I’m talking about are goals like improving VO2max from 64 to 67, lowering resting HR from 60bpm down to 55bpm, increasing heart rate variability from 75 to 80, hitting conditioning test specific numbers, etc. These are the right type of goals. 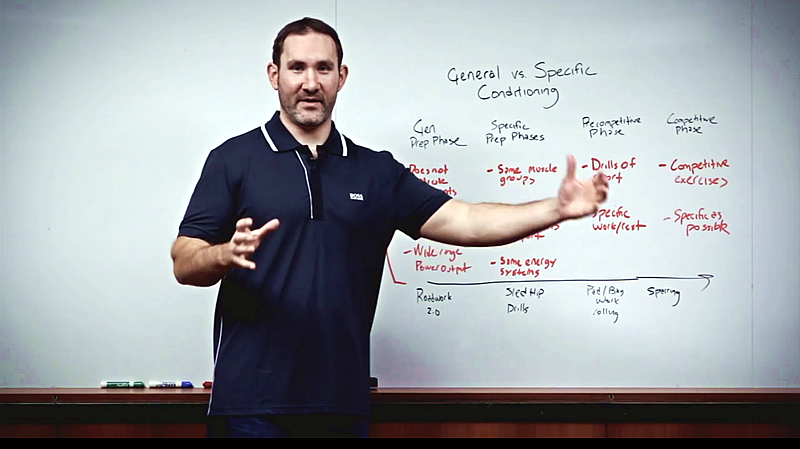 You wouldn’t build a strength program without any idea of what lifts you’re trying to improve strength in, so you should never write a conditioning program without first defining what numbers you’re working to specifically improve. For conditioning programs, it’s typically best to start with no more than 2-3 of this type of goal. You want to build a program that’s focused and trying to 10 different goals is a recipe for a program that will try to do too many things at once. Once you’ve established specific goals for the program, the next step is to figure out exactly how long it’s going to take to achieve them. Of course, this often means that step one and step two go together because if you only have six weeks to get an athlete ready for the season, you’re going to be setting different goals than if they’re just starting their off-season. In other words, the amount of time you have to work with always dictates what is realistic in terms of setting goals for the program. If you’re not dealing with any particular deadlines, however, you still want to create a timeframe for achieving the goals you set in step one and for conditioning programs. Conditioning programs are almost always most effective when they are built around 8-12 week time frames. Why 8-12 weeks? Simple…this is enough time to see a dedicated improvement in conditioning, but not so much that it is likely to lead to overuse injuries, overtraining and/or mental burnout. Let’s face it, people do much better when they are focused on reaching short-term goals instead of longer ones. People will work harder when their goals are weeks away rather than several months or years. There’s a reason that you don’t see gyms flooded with people trying to get in shape to look good for the summer in the middle of October and why P90x wasn’t named P300x. Once you’ve set the overall time frame for the conditioning block, you’ll also want to break this period up into shorter phases. The methods and exercises typically remain mostly constant during each of these phases. 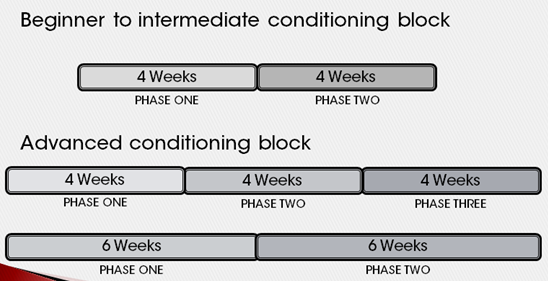 As you can see in the slide above, if you’re building a program for someone that already has a higher level of conditioning to start with, you’ll often want to use a 12-week block broken up into two to three phases. For those with a lower starting point, it’s easier to make progress in shorter periods of time, so an 8-week block with two phases is the way to go. When most people think of a training program, the first thing they consider is the weekly plan – the microcyle. No doubt this is the central component of every program, but by now you should realize why you can’t design an effective weekly plan without first setting the goals and the time frame you’re working with. After you’ve outlined those two elements, putting together the weekly plan is the next and most logical step. The place to start that is by outlining what should be done on each day in terms of the overall training load, i.e. how much volume and intensity will be used and what’s the emphasis, instead of just trying to write in the exercises. Thinking about the training week only in terms of what exercises are done on each day is a common approach that often leads to less than effective programs. Which methods and exercises are most appropriate depends on the training emphasis that particular day and is the place to start. As the name implies, development days are where the highest volumes and intensities are used and the purpose is to push the body to its limits. After years of working with people of all fitness levels, if there’s one thing I’m certain of, it’s that nobody can recover well and avoid overtraining and/or injury from more than three of these days per week – at least not for any real length of time. Because of this, you want to start outlining the training week by selecting which days will be development days. Although there are exceptions, it’s generally best to take at least one day of lighter work, either a stimulation day or regeneration day – which I’ll outline momentarily – before repeating another development day. Just keeping this simple principle of no more than 3 days of maximum volume and intensity will go a long way towards making sure your programs are effective, without being likely to lead to overuse injuries. The next type of day you’ll want to layout within the training week is what I call a stimulation day. Unlike a development day, the purpose of a stimulation day is merely to provide enough volume and intensity to maintain fitness and heighten the body’s functions. This means stimulation days can include either high intensities at low volumes, or moderate intensities at moderate volume. In other words, while these types of workouts are challenging, they shouldn’t cause someone to finish the workout face down on the gym floor. The third and final type of training day that should be used is a regeneration day. If there’s one type of day that’s used far too little in my opinion, it’s regeneration days. The purpose of this type of day is obvious, it helps speed up recovery and allows for greater training volumes without overtraining. People often include rest days within the training week, but passive rest alone is often not enough to truly help the body recover. Regeneration days feature active recovery methods, whether it’s a light workout with concentric only exercise, getting some soft tissue work, performing an activity like swimming, etc., this type of day is absolutely vital to long-term programming success and something missing from far too many programs. Once you’ve made the decision about where to incorporate the three different type of training days, you’ll be well on your way to designing an effective and well orchestrated training week and ready to plug in the methods and exercises. If you’ve read my book Ultimate MMA Conditioning, or even just read through various articles on the site, you’ve no doubt realized one of the biggest differences in my approach and that of many others is that I focus heavily on training methods over training exercises. To me, one of the biggest mistakes that can be made in the programming process is to start by thinking of programming as nothing more than a series of different exercises. When starting with this mindset, it is like trying to build a pyramid from the top down and the program results are almost always less than they could be. This is why it’s so important to have a system when it comes to writing programs, it forces you to work through the process step-by-step in a way that naturally leads to a much more effective program in the end. This is another one of the biggest things I quickly learned once I started developing my programming system. Having a system makes everything easier because each step in the process is a building block for the next one to be set on. Along those lines, instead of working from the top down, exercises should only be thought of as extensions of the methods that are used and of course the methods that you choose depend heavily on the layout of the training week as discussed above. If you’re planning a development day, for example, you’ll of course want to select higher intensity methods and then pick corresponding exercises that fit well into those demands. Likewise, if your plan calls for a regeneration day, you’ll want to avoid those same high intensity methods and exercises and pick something that’s more appropriate. To really speed up the process of writing programs and make your system that much more powerful, it’s important to create a database of the methods and exercises that you like to use when you program. Whether you use a simple tool like excel, or more complex software, building a database is as simple as creating a categorized list that you can turn to each time you create a new program. Over time, chances are that you’ll both add and subtract from this database as you refine and develop your programming strategies over time. One thing I’ve learned over the years is that less is often more when it comes to building programs. If you look at the programs of many of the most successful coaches out there, you won’t find a hundred different exercises or methods, but rather very few. This is because with the right system in place, it becomes much easier to determine which methods are effective and which ones aren’t. When used properly, your conditioning system will help you streamline your programs to the bare essentials of what’s most effective. Instead of feeling overwhelmed and wasting time agonizing over which exercise to choose, you’ll effortlessly be able to plugin the ones that you’ve found work the best and avoid creating what I like to call “kitchen sink” programs that have become so common. Again, this is the beauty of having a system in place rather than just starting from scratch each and every time you develop a program. McDonald’s had it right, systemization creates consistency and consistency leads to progress. If there’s one aspect of programming that almost every coach and trainer would agree can be extremely challenging, it’s periodization. Although countless books have been written on the subject and endless models portrayed with fancy graphs and charts, the truth is that a lot of coaches don’t have a very good handle on how to effectively use periodization within their programs. Stated in the simplest of terms, periodization is the manipulation of volume and intensity over the course of the training program. The single reason why periodization is so important? Simple, volume and intensity are the two biggest drives that lead to changes in fitness and performance and if you don’t change either one for weeks on end, the result will invariably be a plateau. Without the right periodization model, a program doesn’t really extend beyond the training week. WIth the right model, however, steady, long-term improvements in conditioning can be achieved without frustrating plateaus and/or overtraining related injuries and problems. Although a discussion of all the different periodization models and their pros and cons will have to be a topic for another day, I do want to offer some tips on the overall structure of how periodization should be applied. As you can see in the graphic below, periodization should consist of four stages – introduction, loading, stabilization and restoration. The purpose of each of these four stages is to use changes in volume and intensity to drive improvements in fitness. During the introduction phase, typically 2 weeks in length on average, the new program is introduced and you’ll likely see rapid increases as the result of as nothing more than the body getting used to the new type of stress. It’s not necessary to use high levels of intensity or volume in the introduction phase because it’s unnecessary and can lead to overtraining in the later parts of the program if too much is used in the beginning. This is another mistake that’s often made as people get excited to start the new program and think the more volume and intensity they use, the better. The next phase of a well periodized program is the loading phase. As the name implies, this is where volume and/or intensity begins to consistently increase in order to push the body to continue improving. The loading phase is the most challenging because if the increase in loading is too high, overtraining and injuries can result. If the overall loading is too low, however, then plateaus are inevitable and the higher the level of athlete, the finer this line between the two becomes. The real key here is to start with rather small changes, no more than 5% per week in terms of volume or intensity and gauge the result. If progress isn’t made, increase by more than that the next week. As long as there is consistency in training and the overall training load – the combination of volume and intensity – is increased in one way or another during the loading phase, the body will continue to adapt and fitness will increase. The length of the loading phase, most often 4-8 weeks, dictates how volume and intensity should be changed over time. Longer programs typically require bigger changes in volume, while shorter ones should be more driven on intensity. Upon completion of the loading phase, the next step is to give the body a chance to stabilize at the new levels of stress. Far too often, this phase is completely missing from programs and right after loading, the program progresses into a “deload” or recovery week. The problem with this strategy is that the body needs time to achieve a new set point. A sudden decrease in loading right after the loading phase will often lead to a decrease in fitness more than anything else. The stabilization phase should last 1-2 weeks and it should generally feature roughly the same load throughout that time. Again, this is absolutely vital to make sure that the improvements in fitness “stick” so to speak and aren’t just transient in nature. Once the body has stabilized, the final phase is the restoration phase. Here again, it can be common to feel the need to make drastic reductions in volume and/or intensity. It’s easy to understand why this may seem like the right idea, but again this can lead to negative changes if the decreases are too big, or for too long. A general rule of thumb is to keep intensity at 90% of what it was in the stabilization phase, while reducing volume by 20-30% at most. These are only general guidelines, of course, but they’ve worked well for me and as long as you’ve followed the previous four steps in the system, they’ll do the same for you. Even though periodization can be as complex a subject as you want to make it and you can spend hours debating and agonizing its finer points, keeping things simple here is always better. Each and every week within the loading phase if you simply work to adding a few sets here and there, strive to add weight to the bar or train at higher heart rates, use shorter rest periods, etc., and follow the four stages outlined above, you’ll find periodization doesn’t have to be complicated to be effective. Now that I’ve outlined the five step system I use to create world-class conditioning programs in 15 minutes or less, it’s time for you to start building your own system and putting it to work in your programming. There may be an initial investment in time and effort up front, but I guarantee it’ll pay off in the long-run for you – not to mention for the athletes and clients you work with – just as it has for me. Being able to write effective programs is an absolutely vital skill that you must have to be successful in this industry for the long-run. Literally anyone can write a training program that works for a month, but surprisingly few can write a program that continues to work for a year. The difference between the two is nothing more than having the right system. That’s why I decided to put everything I’ve learned about conditioning into one complete, practical, self-study system: The BioForce Certified Conditioning Coach course. 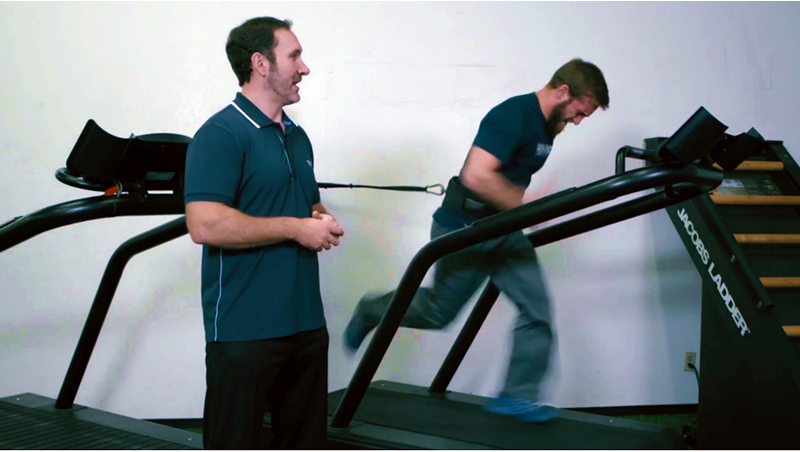 It’s the first and most-respected conditioning certification in the world. To learn more about this complete self-study system, join the special Insider’s List below. Spots are first come, first served. how do numbers 2 and 5 fit together? in point 2, for a beginner you recommend a block of 8 weeks, with 4 weeks for phase 1 and 4 weeks for phase 2. in point 5 you recommend a linear periodization with 2 weeks of introduction, 4-8 weeks of loading, 1-2 weeks of stabilization, and then a restoration phase without a timeframe but let’s say 1 week. the shortest that could be would be 8 weeks. however, does this span across the two phases mentioned in point 2? i would think each phase would be a set of exercises that would show increase in volume/intensity, meaning you would need 2 phases of 8-12 weeks in each block. even for advanced blocks your phases are only 6 weeks. could you clarify if the periodization loading you showed is within a phase within the block, or across phases? if it’s across phases, how do you set up the exercises across phases to allow you to continue to load when you switch to the new exercises as part of the new phase? Thanks!